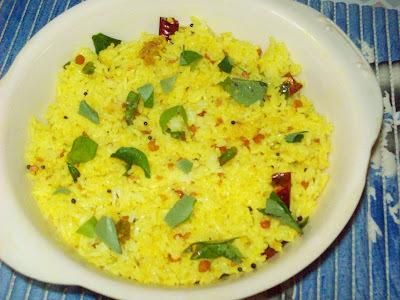 Ruchi: Lemon Rice & Coconut Rice. Lemon Rice & Coconut Rice. 1. Pressure cook rice with 2 cups of water. Each grain should be separate. 2. Heat oil in a kadai, add mustard, when it splutters add the bengal gram dal, urad dal, red chillies . Fry till golden and add turmeric after a while. 3. Add green chillies and curry leaves, fry for a moment and put off the flame. 4. Squeeze lemon and take its juice. 5. 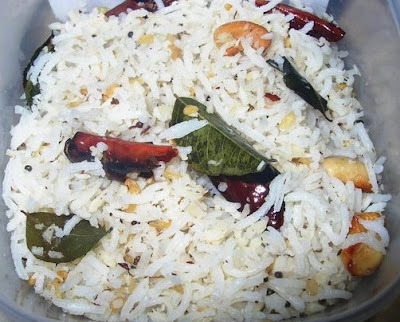 *Take rice in a shallow bowl, add, salt, asafoetida, and pour the lemon juice. Add the seasoning from the kadai. 1. Pressure cook rice adding 2 cups water.The rice grains should be separate. 2. Heat ghee in a kadai, add mustard, after it splutters add bengal gram dal, urad dal, red chillies. Add cashews after a while and fry till golden. 3. Add green chillies, curry leaves and coconut. Stir continously on a medium flame till the coconut turns slightly golden in colour. 4. Transfer the rice into a shallow bowl, Allow to cool a little, add 1 teaspoon ghee. This helps to separate the rice grains. 5. Add the coconut mixture, mix lightly with out mashing the rice. 6. Transfer to a serving bowl .Serve with papad and vadaam. Cashews fry faster than the dals so add after a while. If you are not comfortable fry them separately.